What are the conditions and etiquettes of wearing a turban (`imamah)? Firstly the material which the turban is made from must be permissible to wear and not silk for example. Secondly it must be worn with a good intention such as following the Prophet ﷺ and the person wearing it must not be doing so to show off. There are a number of etiquettes. It should only be worn after the age of puberty out of veneration for this sunnah. Some people put a turban on their children with a good intention but this should not be done. Some scholars even regard the turban as a garment of adornment which should only be worn after getting married. It should be worn while attending the Friday Prayer and at other important gatherings. It should not be excessively large or small. The longest turban which the Prophet ﷺ is recorded to have worn is 7 or 10 or 13 cubits but it is only fitting for scholars and pious elders to wear a turban this length. An appropriate length for students of sacred knowledge and those who wish to follow the sunnah is 5 cubits. 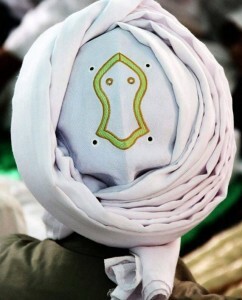 When tying the turban, a tail or two tails (`adhbah) should be left at the back in accordance with the Sunnah.